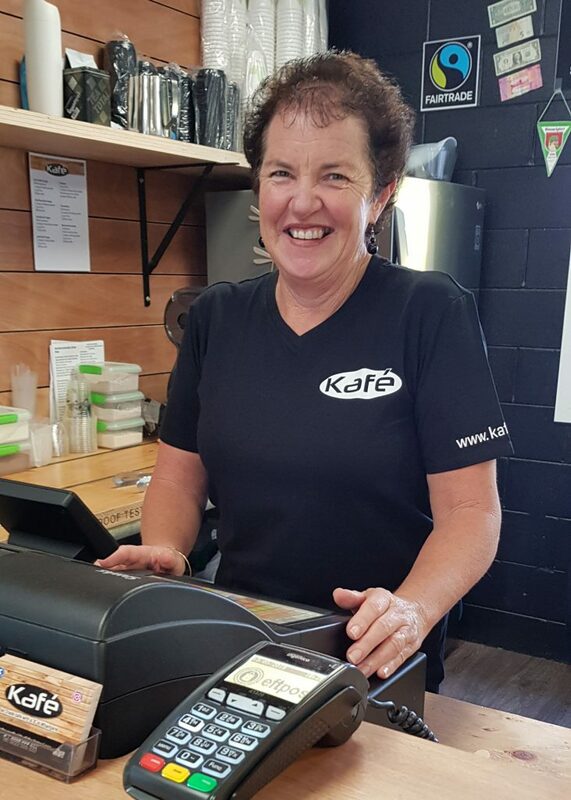 Welcome to cafe with a ‘K’ only in Whangarei. 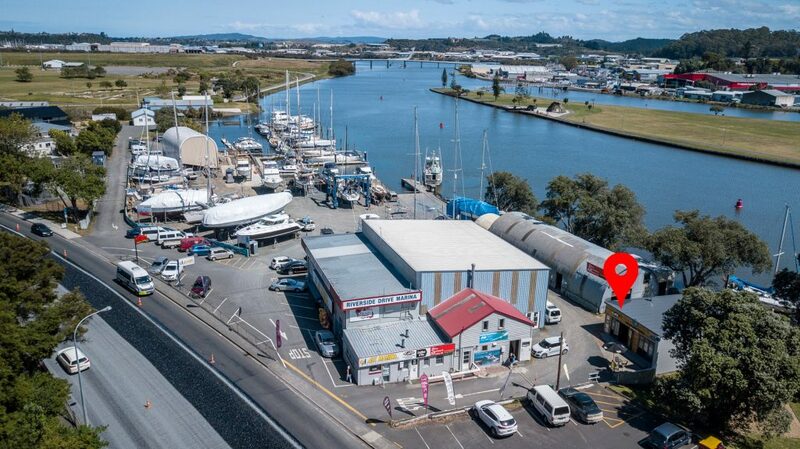 You’ll find us inside Watermans World at 52 Riverside Drive, Whangarei. Beside the Riverside Hatea Loop playground. Here's a wee video to wet your appetite. 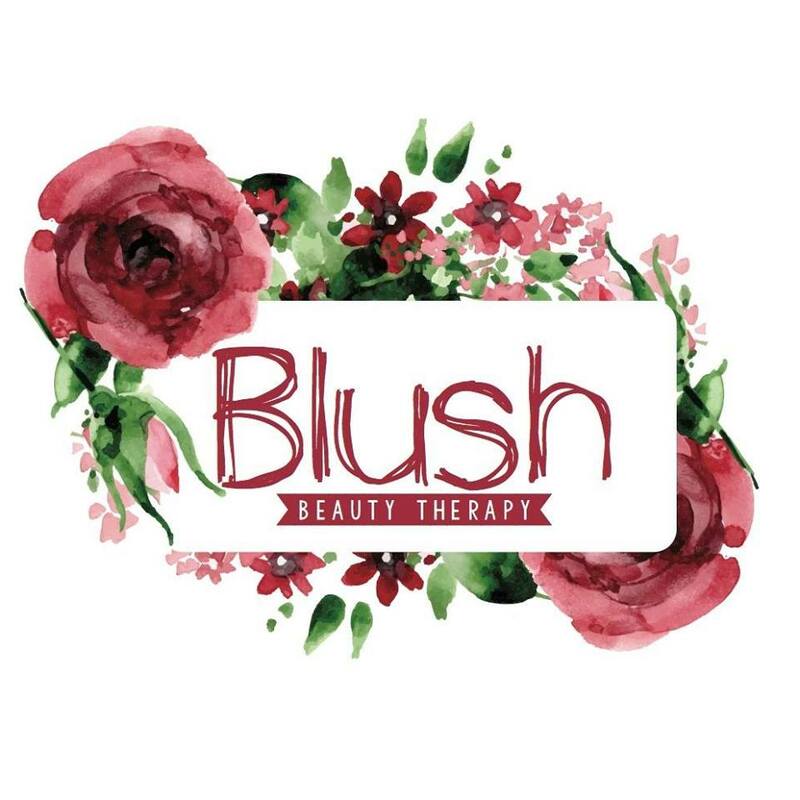 Come on in and see us sometime soon. Open Daily 8:00am to 3:00pm for your Fair Trade Organic caffeine fix or Swiss Water Decaf and Chai too! 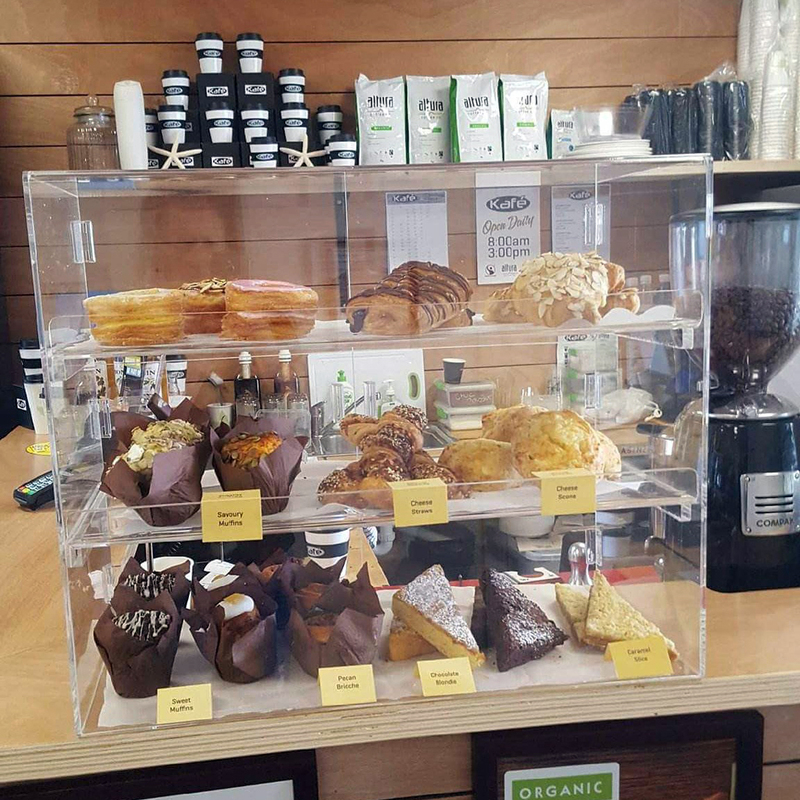 We have a yummy range of snacks using natural ingredients and Dad’s Pies (only the best), plus smoothies, frappes, cabinet cold drinks and ice-creams too! Come on in and check out our riverside courtyard. Take some time to breath in the atmosphere. We guarantee you’ll enjoy it! 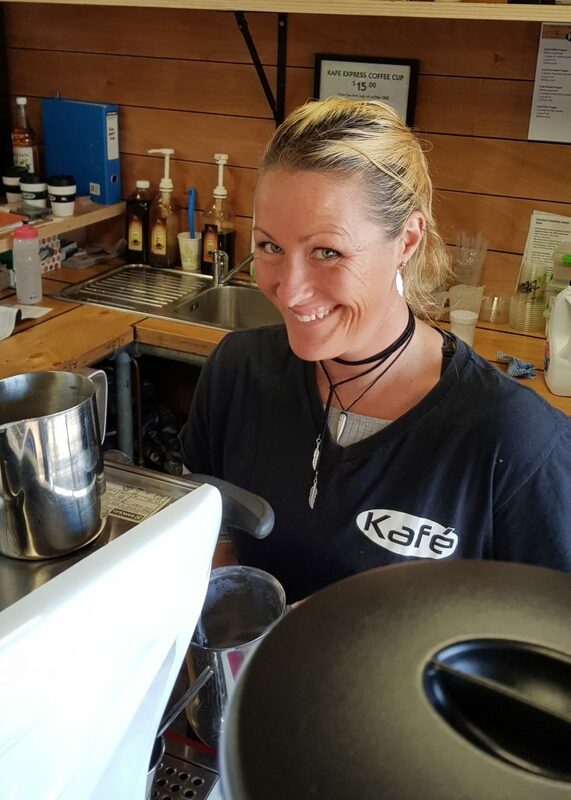 Meet Paula, she’s here Wednesday to Sunday, with a warm smile and a friendly ear. 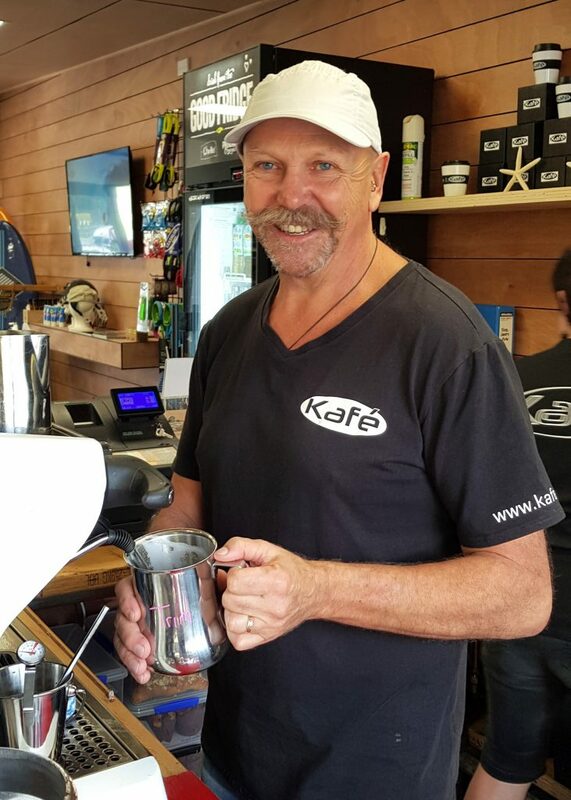 Meet JK, when’s not at Total Idea Co you’ll find him here making coffee and selling SUP’s. Meet Nic, Nic’s our Monday Tuesday Barista who couldn’t be happier behind the espresso. Meet Hanna, Hanna’s here every Wednesday, Thursday and Friday making excellent coffee. Meet Shona, Shona’s our go-to when we’re busy, you’ll find here her every Saturday and Sunday. The Dad’s Pies secret to making a great pie. ‘Let’s only ever make pies we want to eat,’ came the cry. Then ‘Let’s also make them good for you,’ came another cry. So once we’d worked out where the echo was coming from, we began a lifelong pursuit of pie-fection – mixing wholesome, top-notch ingredients with plenty of love and care. Delicious spicy alternative to coffee made with foamy milk, dusted with cinnamon – Sweet option available too! So naughty but so nice. Kafe is just off the beaten track for people walking the Hatea Loop. John & Paula Kearney have mastered the coffee machine. Relax on the outdoor patio by the Hatea River. 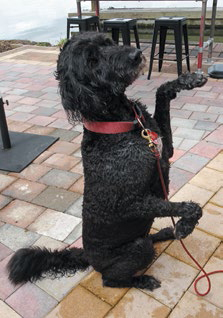 Begging may bring forth a treat. Error validating access token: The user has not authorized application 1123168491105924.
Business owner of Total Idea, John Kearney, of Onerahi and his friend Karl Roberts, Manager of Riverside Drive Marina were paddle-boarding down the Hatea River one Tuesday night when a totally new idea came up in the conversation – starting a cafe. Karl was moving his business Watermans World to a new building closer to the Hatea River and he suggested it could also accommodate a cafe. They pondered the idea that John and his wife Paula could set it up. John and Paula discussed it and decided it would be a good place to have a whistle-stop cafe. It would be right next to a free parking lot, the Riverside Hatea Loop Playground, the Hatea Loop shared pathway which runs right past the proposed entranceway – and also it would be accessible to river traffic. 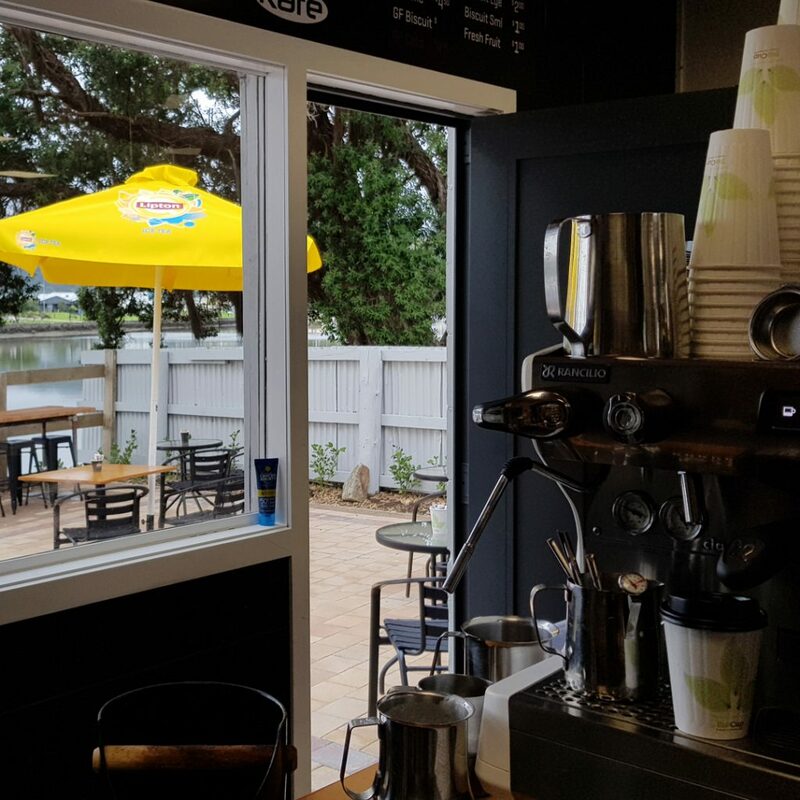 On Labour weekend, last October Kafe opened for business at 52 Riverside Dr, between the Riverside Drive Marina building and the parking lot on Riverside Dr.
A warm family atmosphere gives visitors to Kafe the feeling that they are expected. It was the Kearneys’ aim to have a place where the ambience would get people talking to one another and getting to know each other and the setting they have created for Kafe fits the bill nicely. “The art of conversation is lost today and we are trying to encourage it here,” John said. So now there is a nice little riverside retreat on the northern leg of the Hatea Loop and shared pathway, with a courtyard, right up to the water’s edge and the shade of a pohutukawa tree. Sea craft of many kinds, from small boats to paddle boards ply the river and some pull in to the little wooden dock which is linked to the Kafe courtyard by a wooden gangway. The courtyard is laid with pavers and has a wooden fence down one side which completes the feeling of seclusion and helps muffle outside activity, especially traffic noise. Patrons can look up the Hatea River towards the Town Basin or down-river to Te Matau a Pohe, the bascule bridge, framed in a fork of the pohutukawa. Daily papers are provided for customers who can choose from a variety of seating in the courtyard. There are also two small round tables and one long communal table inside the cafe itself. 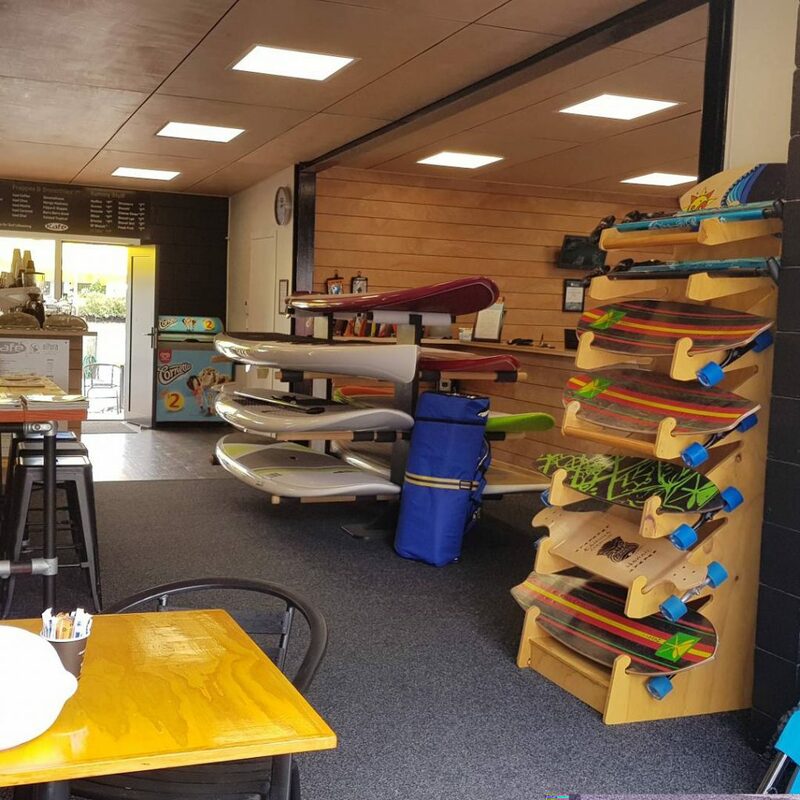 While they are there, customers can check out Karl’s standup paddle boards, cruisers, racing boards and his new foiling board, not to mention the land paddling boards. 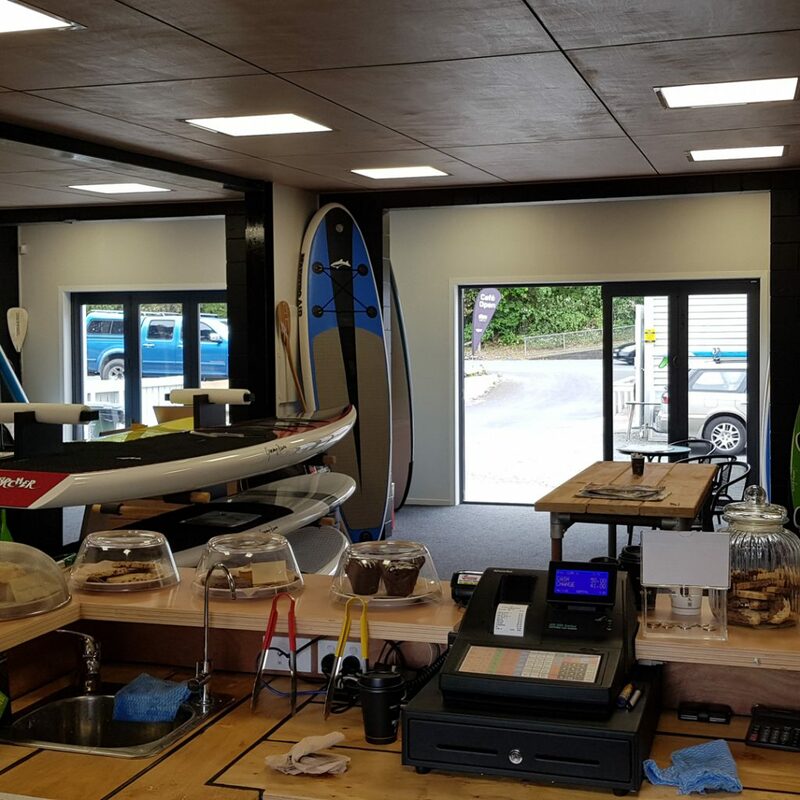 On weekends John takes the reins over from Karl and looks after his shop and any customers checking out the paddle boards and gear. 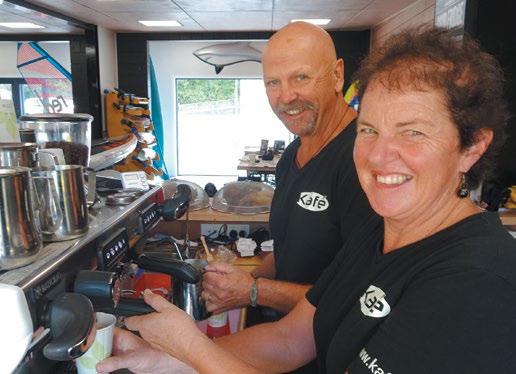 Although neither of them has run a cafe before, John and Paula have had a lot of experience dealing with the public and neither of them is new to running a business. Dogs are welcome to come to the cafe, a big plus for people walking the Hatea Loop and the cafe is pram friendly with wide entrances, a spacious courtyard and bright sun umbrellas for most tables. Also there is a bike stand around the back, by the courtyard. John and Paula have a lot of cafe regulars already like Gregg and Josie with their dog Zeus. They like to sit, drink their coffee and watch the water traffic go by while they are out walking with Zeus. “It’s great. 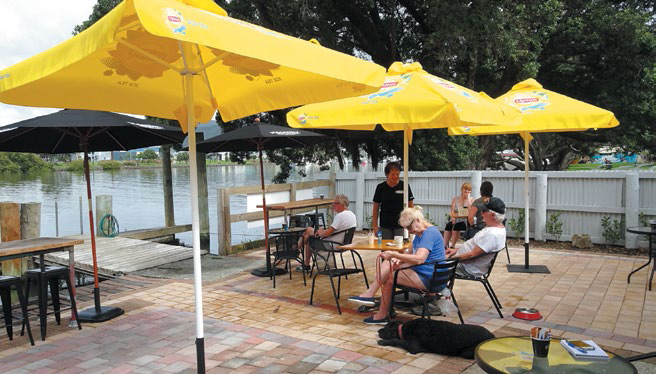 We need more of them [cafes], dog friendly, right on the water, park next door,” Gregg said. 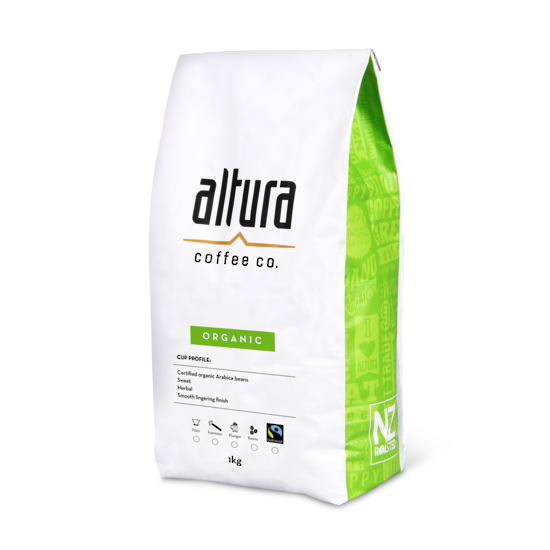 The cafe is open seven days a week, from 8am to 3pm and sells Altura Fair Trade coffee, tea and a range of beverages and a variety of smoothies some made with Fair Trade bananas. 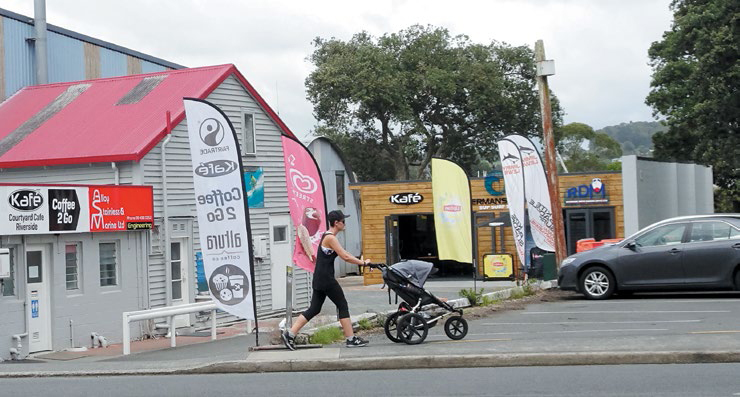 Their cafe provides sweet and savoury counter food only, appealing to customers who want a coffee break or something to eat on the move, but not meals. 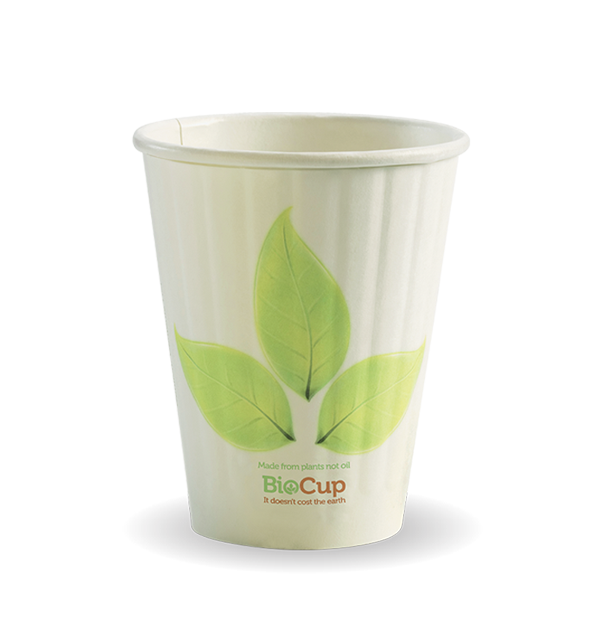 Drinks are served in takeaway cups which, along with their lids are compostable. 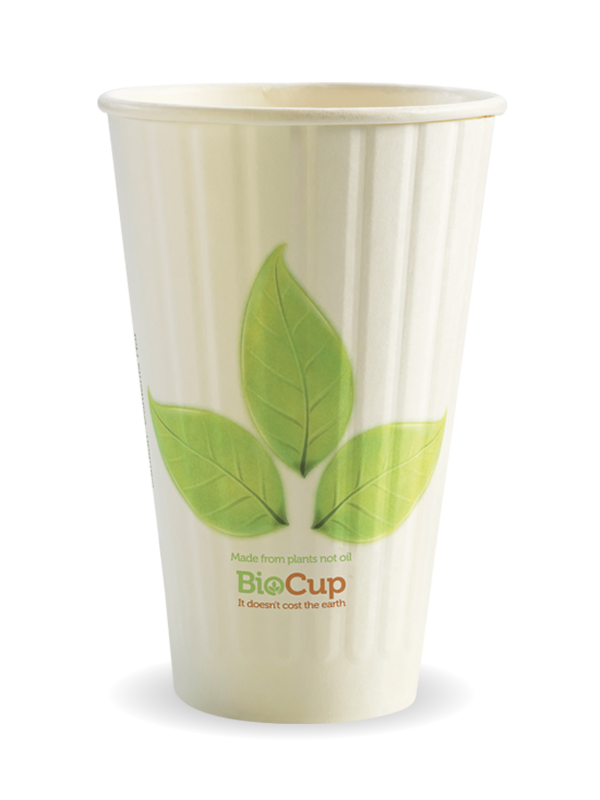 They offer a range of milks including soy and almond milk as well as full cream and trim cow’s milk. During the week they are joined by part-timers Nic and Hanna for a few days. Weekends, they say, are the busiest. Sometimes they are flat out with a rush of customers and family members come in to help out too, Paula said. One day they had five people working to meet the demand of customers. “Family are very supportive and help us out, something which we are very grateful for,” Paula said. Meanwhile, John is still running his graphic design business Total Idea and Paula her marriage celebrant work. John is also a surf lifeguard (SLA) and an Inflatable Rescue Boat (IRB) examiner for Northland and Auckland region as far south as Raglan. 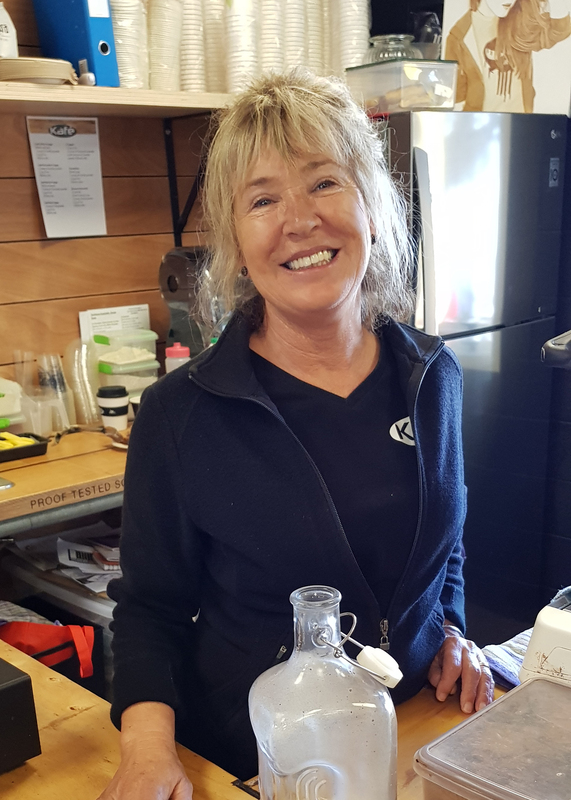 John and Paula were both honoured with service awards in the Surf Lifesaving Northern Regional Awards in 2015.
creating direct and long-term trading relationships between farmers and traders. 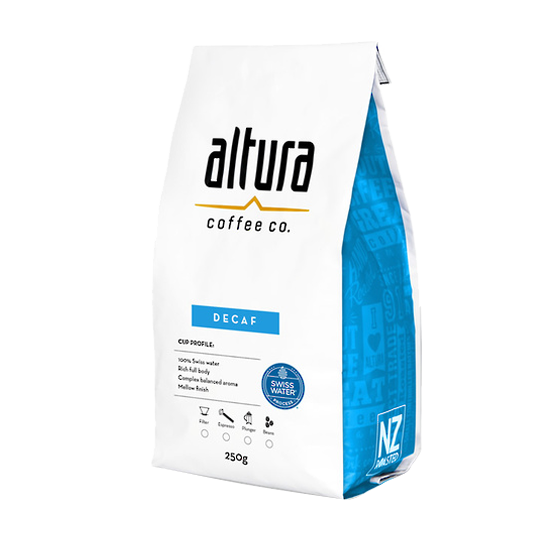 Altura Colombian decaf uses the Swiss-Water decaffeinating process which is 100% natural. The Swiss-Water method is the most traditional, as it involves no chemicals. 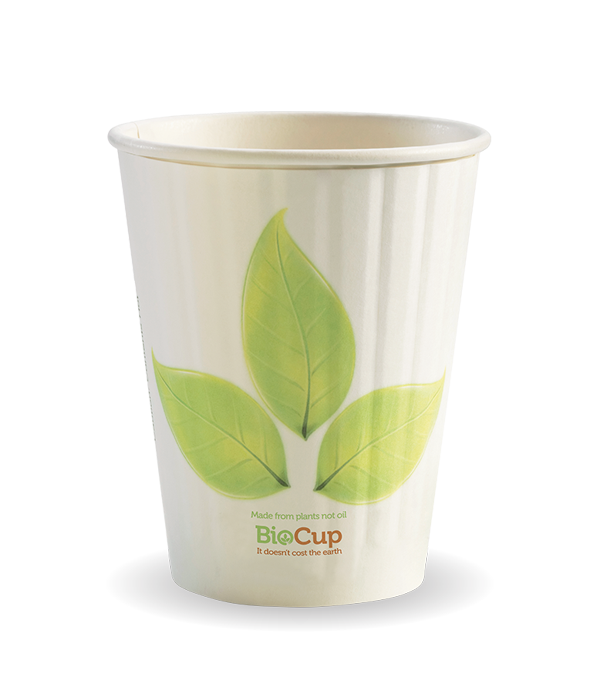 This decaffeinating process effectively removes a minimum of 97% of caffeine from the green bean to ensure that it can be classed as a true decaffeinated coffee. 52 Riverside Drive, Whangarei, NZ.